Welcome to fashion high, where you’ll find all the cliques you remember from your days in the high school cafeteria. Only this time, everyone is sitting together based on which F/W 18 runway trends they’re wearing this season. The result? Five stylish high school cliques with their own distinct brands of cool fashion for the season. Whether you’re dedicated to chunky new-age sneakers or you’ll never stop wearing head-to-toe black, there’s a clear group of like-minded friends you’ll be sitting with. Want to see which high school clique you’d be in now? Scroll down to check out the five most stylish high school cliques from the class of fall 2018—from party girls wearing puffed-up ’80s dresses to art kids decked out in bold neon. Here, you can figure out which one you’ll be joining this fall—whether you knew it or not. Have your eye on all things ’80s? Do you think the bigger the puffy sleeve the better? 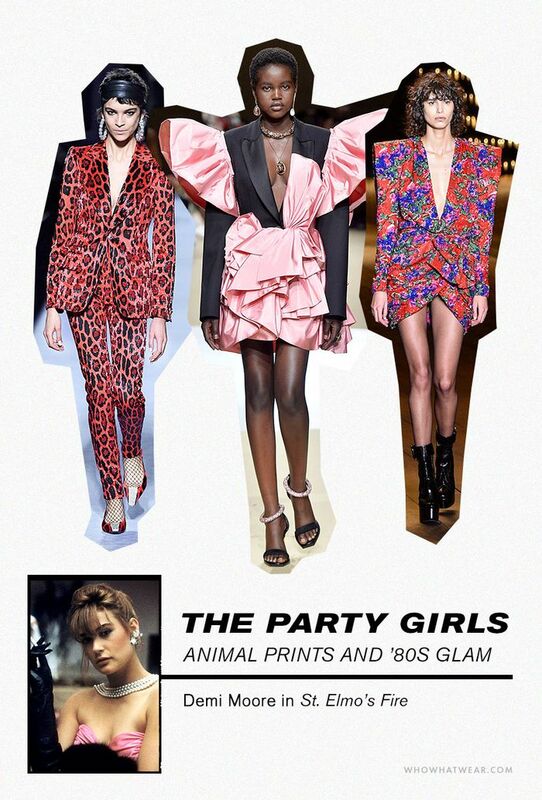 You fit in with the party girls who will be wearing everything from Saint Laurent’s bold-shouldered blazer dresses to statement pieces from Magda Butrym to all things leopard. There were nearly identical versions of this dress floating around all of the cool parties in the ’80s. You’ll want to pair this with some over-the-top crystal earrings. Replicate the runway look from Tom Ford’s show and wear the blazer without anything underneath. If you’re ready to step into the future with all-black everything, you’ll be hanging out with the rest of the goths. Snap up a zipper dress straight from Alexander Wang’s runway show and get a pair of angular sci-fi sunglasses from Poppy Lissiman. Wear your hair slicked back to go full Matrix. Wear this on its own or with tights layered underneath. It doesn’t get any cooler. Chances are you’ll be hanging out with Cher and Dion if you’re slipping into your check-print pieces this fall. You probably have tartan sitting in your shopping cart already, including Versace’s very Clueless-inspired looks. And yes—twinning is encouraged. The whole Versace show instantly made me think of Clueless. If Cher Horowitz lived in NYC, she would definitely own this. To wear with sweaters and a blazer layered on top. Never met a pair of sneakers you don’t love? You and the rest of the jocks have that in common. This season, trade out your more practical running shoes for chunky styles with thick soles—like the bejeweled style spotted at Gucci. The crystals are removable, but why would you want to do that? At $100, what’s stopping you? If you’re one of the early adopters of bright, funky neon colors, you and the rest of the art kids will be hanging out. You aren’t afraid of out-there shades like fluorescent yellow and highlighter pink, and you’ll be the first ones wearing Balenciaga’s electric plaid knife mules. I haven’t spotted cooler shoes this season. This is what I call a neon dream. Wear this on its own or layered under a bright coat.